From the galaxy-spanning Clone Wars to the struggle between the First Order and the Resistance, war permeates the universe. Alliances are formed to topple galactic empires, undermine long-standing republics, or simply to ensure their own survival. 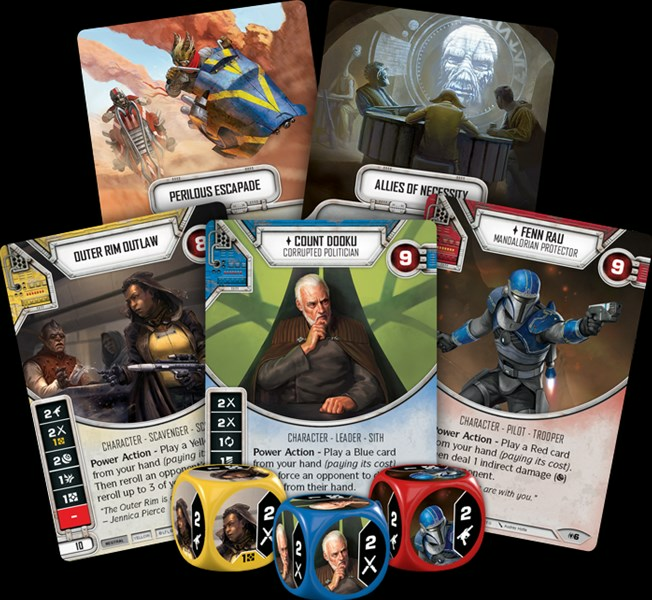 Fantasy Flight Games is proud to announce the Allies of Necessity Draft Set for Star Wars: Destiny! Allies of Necessity features twenty new cards that can be used to supplement your pool of cards and provide a base for your draft or sealed event, while also providing new options in constructed deck building! Like Rivals before it, players just need a copy of Allies of Necessity and six Star Wars: Destiny booster packs to participate in their very own draft or sealed event! What's more, the cards in your Allies of Necessity Draft Set are completely reusable—no matter how many drafts you play, you'll only ever need to buy a single copy of Allies of Necessity to enable your draft games of Star Wars: Destiny!